As the reputation of JIMS goes, onlyclassroom teaching is never the game. Gearing up for the course to be newbudding management graduates 36 students visited production plant of theleading player in mineral water segment: BISLERI (A PARLE India undertaking) onJuly 7 &10, 2015. The visit started with a presentation ofentire business outlay. 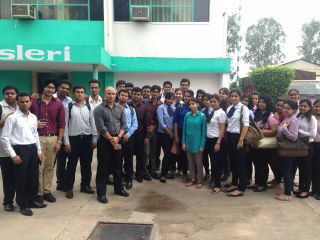 Students came to know how the product grows from ideato plant, plant to market and market to consumer. The major learning of thesession was about supply chain, quality control mechanism and marketingstrategies of BISLERI. Students also came to know all products of BISLERI,which they were unaware initially. Future plans of BISLERI are shared in thesession along with mission and vision of the company. In phase two of the visit, students visitedthe plant. Students came across nuts and bolts of manufacturing process. Theyunderstood plant layout, production planning and control, warehouse managementand inventory control in real environment. In a nutshell, the visit was a successfullinkage between theory and practical. 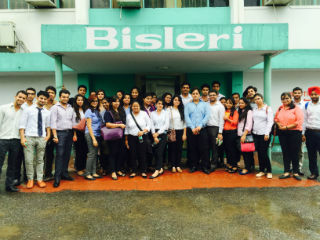 JIMS extends a warm thanks to BISLERI forproviding this opportunity to our budding managers.